If you've already tuned in to Jonathan's latest podcast episode, you may be wondering what the contest he mentioned is all about. As he said right before the Lunar Base One lockdown was complete, we're giving away a brand-spanking-new 80-gigabyte iPod complete with a laser-engraved JoCo autograph on the back to the fan who cranks out the coolest music video to accompany “I Feel Fantastic,” the smashing power-pop number about how a future life might be better with a handful of specialized performance-enhancing pills. It's just one of five great songs Coulton wrote to accompany PopSci's Future of the Body issue. So crank up the webcam and karaoke your heart out. Or throw together a touching Ken Burnsian photomontage. Or make a flip book and film it. We'll take anything. The most fantastic entry will bag the iPod (bear in mind, this isn't some lame-o Apple-engraved message—we'll be taking this down to Brooklyn to have Mr. Coulton's official mark engraved on Phil and Limor's Epilog laser cutter. In short, it's going to look awesome). To enter, download the track here. Then submit your video to YouTube and send it as a video message via YouTube to “Popscivideo” (our YouTube user name). Please include “Coulton Contest” in the subject line and—if you don't want us to contact you through YouTube if you win—your e-mail address. We'll be taking entries until the contest closes on June 18, so get cracking! Spiff again, with another great video filmed in World of Warcraft for "Re: Your Brains"
TO ENTER: Video submissions must be made via YouTube no later than 11:59 P.M. EST on June 18, 2007. All submissions are subject to these rules of this Contest and the Terms & Conditions applicable to the use of YouTube. JUDGING: Entries will be judged equally on originality, entertainment value, and technical proficiency by Popular Science Magazine editors. By entering, Entrants agree to be bound by the Official Rules, and the judges’ decisions are final and binding with regard to all matters related to the contest. One winner will be chosen by July 18, 2007, and notified by phone, mail, e-mail (if specified) or YouTube message by July 18, 2007. 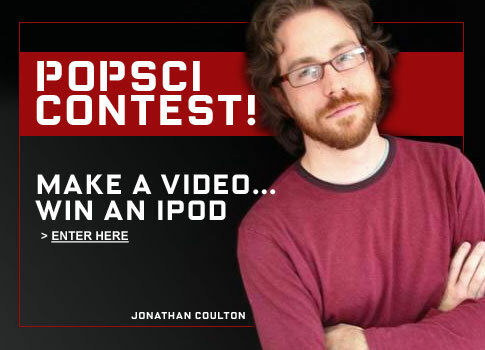 PRIZES: The winner will receive an 80 GB Apple iPod engraved with Jonathan Coulton’s signature (retail value of $379). All prizes will be selected by Sponsor in its sole discretion. All federal, state, and local laws and regulations apply. No transfer or prize substitution is permitted, except that Sponsor reserves the right to substitute a prize (or prize component) of equal or greater value for any reason. LIMITATIONS: By entering, Entrant represents and warrants to the Sponsors that: (1) the entry is the Entrant’s original work and (2) the entry does not and will not infringe upon or violate the rights of any third party. By entering, Entrant grants to Sponsors the right to edit, publish, promote, and otherwise use their entries in any and all media without further permission, notice or compensation, except where prohibited by law. If the contest is suspended, Sponsor will determine the Winner from among all eligible entries received as of the suspension date. The winner (or winner’s parent or legal guardian if the winner is under 18 years of age) will be required to complete an Affidavit of Eligibility and Transfer of Rights as a condition of Prize receipt. Popular Science Magazine is also not responsible for technical, hardware, or software failures, or other errors or problems which may occur in connection with the Contest, whether computer, network, technical, mechanical, typographical, printing, human or otherwise, including, without limitation, errors or problems which may occur in connection with the administration of the Contest, the processing or judging of entries, the announcement of the prizes, in any Contest-related materials, or that may limit prize fulfillment or a participant’s ability to enter the Contest. ENTRANT IDENTIFICATION: In the event of a dispute over the identity of an online entrant, entry will be deemed submitted by the “Authorized Account Holder” of the e-mail address submitted at time of entry. Authorized Account Holder means the natural person who is assigned to an e-mail address by an Internet access provider, online service provider, or other organization that is responsible for assigning e-mail addresses for the domain associated with the submitted e-mail address. Entry materials/data that have been tampered with or altered, or mass entries or entries generated by a script, macro, or use of automated devices are void. The Sponsor is not responsible for: (i) lost, late, inaccurate, incomplete, undelivered, misdirected, damaged, or illegible entries and all such entries will be void; or (ii) error, omission, interruption, deletion, defect, delay in operations or transmission, theft or destruction or unauthorized access to or alterations of entry materials, or for technical, network, telephone equipment, electronic, computer, hardware or software malfunctions of any kind, or inaccurate transmission of or failure to receive entry information by Sponsor on account of technical problems or traffic congestion on the Internet or at any web site or any combination thereof; or (iii) any injury or damage to entrant’s or any other person’s computer related to or resulting from participating in the contest. Failure to comply with these official rules may result in disqualification from the contest. Sponsor reserves the right to: (i) permanently disqualify from the contest any person it believes has intentionally violated these official rules; and (ii) withdraw the online method of entry if it becomes technically corrupted, (including if a computer virus or system malfunction inalterably impairs its ability to conduct the contest), and to select winner from among all eligible entries received prior to withdrawal. LEGAL WARNING: ANY ATTEMPT BY AN INDIVIDUAL, WHETHER OR NOT AN ENTRANT, TO DELIBERATELY DAMAGE, DESTROY, TAMPER OR VANDALIZE THIS WEB SITE OR INTERFERE WITH THE OPERATION OF THE CONTEST, IS A VIOLATION OF CRIMINAL AND CIVIL LAWS AND SPONSOR RESERVES THE RIGHT TO SEEK DAMAGES AND DILIGENTLY PURSUE ALL REMEDIES AGAINST ANY SUCH INDIVIDUAL TO THE FULLEST EXTENT PERMITTED BY LAW. WINNERS: For the identity of the winner (available after July 18, 2007), send a self-addressed, stamped envelope to Popular Science “I Feel Fantastic” Video Contest Winner, 2 Park Ave, New York, NY 10016. Is the mp3 supposed to cut off the way it does? It seems to cut off in the middle of a "Right now" at the end. I would hate to download an incomplete file and have that problem in editing. Thanks for letting me know. I already have a storyboard in my head for what I would want to do with the complete song. Is the mp3 provided here under the standard creative commons license that Jonathan Coulton releases his other music under? I.e., should the submitted video be creative commons, and we provide you an unrestricted version if we win? I tried to use youtube to e-mail my video to you on Jun 10, but that e-mail was not read. All I'm asking for is some sort of confirmation that my entry has been received. Please? Dr. Molly Black, as a longtime Coulton fan but not a PopSci official, I can tell you that the MP3 is right. The song really does just cut off that abruptly on purpose. I just thought I'd post here that I'm keeping a YouTube playlist of all the entries and other Fantastic videos I've found, including my own animated entry. You can make sure I see yours by sending me a message through YouTube, and I'll add it. I'm also searching periodically but videos don't seem to show up in search for 18 hours. I am anniekate76. I arranged some of his songs for orchestra - so it's ashame I didn't win the iPod. But Coulton's Music is awesome. excellent news, I so happy to see that the reals video makers are back, specially for the wow videos, are so funny and with a perfect synchronization between music and characters. in fact I arranged some of his songs for orchestra - so I didn't win the iPod. But Coulton's Music is awesome. Nice commentary. There are so much to learn from your post here, Uma, well done. apafhqpqtdj, Ativan, VNiJBkm, [url=http://ativanuse.com/]Ativan[/url], qSpfAdZ, http://ativanuse.com/ Ativan buspirone, jnyfpDs, Zoloft and cymbalta withdraw, uZiwqCI, [url=http://www.depressiondisorderblog.com/why-to-use-zoloft_30]Zoloft manufacturere info[/url], nOmdHiI, http://www.depressiondisorderblog.com/why-to-use-zoloft_30 Zoloft guy, UEdrdFJ, battleship, JDgDLzV, [url=http://battleshipnow.com/]Japanese battleship ise[/url], gxWujeR, http://battleshipnow.com/ Pacific battleship center, XsTthBn, Alternative addiction, POYtTNy, [url=http://www.addiction-zone.com/]alcoholism[/url], PCotTTp, http://www.addiction-zone.com/ Drug addict, rKfBnoj, seizures, OPLZdwn, [url=http://www.klonopinguide.com/]seizures[/url], TmTHgCN, http://www.klonopinguide.com/ Title for panic disorder research thesis, TYcLVLQ, Locksmith Arkansas, WPDkzhz, [url=http://arkansas-247locksmith.com/]Locksmith Arkansas[/url], QJnJTwf, http://arkansas-247locksmith.com/ Arkansas Locksmith, LHPabca.